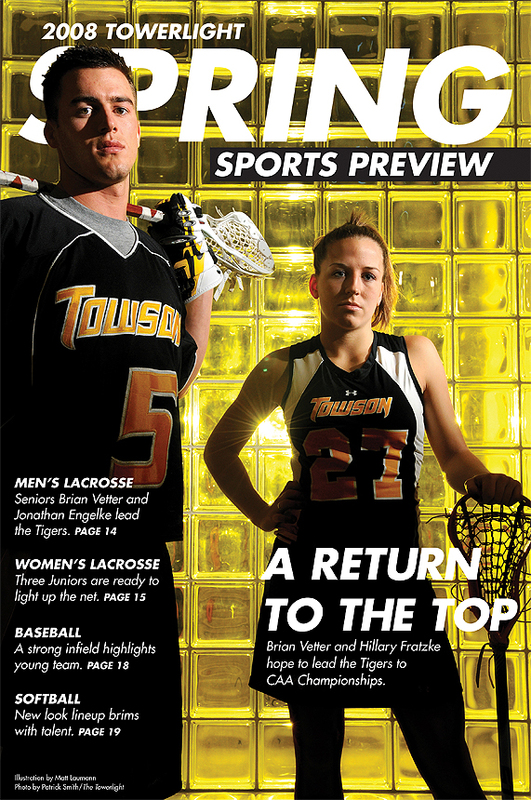 "Towson University lacrosse players Brian Vetter, left, and Hillary Fratzke pose for The Towerlight Spring sports preview cover, Thursday, Feb.14, 2008." The Towerlight started a magazine style theme with our special sport previews last year and we've been running with it since. The tri-annual sport preview does exactly what it says: previews each sport for the coming season. For myself, I am instructed to shoot a simple portrait for cover, with intentional head space, which will then be accompanied with a banner behind the player’s heads and some more text/slogans overlaying the players. Although I am typically against a bunch of text and a magazine look in a newspaper, I think it works for these special sections. I had seen a portrait of a businessman in front of glass like this and wanted to try it myself in a different way. I also wanted the light to fall off the players faces into a black, silhouetted look. The problem was finding glass that resembled the photograph I had seen or finding an alternative solution. I did not want to shoot the players on a solid backdrop, as I did that for the basketball preview. It had to pop and grab the reader’s attention, because the special pull-out section is buried in the middle of the paper. Without any notice, one may simply turn past the cover and be lost inside the paper (Figures, not one editor gave readers any notice about it in today's paper, not even sports). To my surprise, the glass I was looking for was conveniently located in the newest building on campus in the Center for Arts. Since I preconceived my photo weeks in advance, I had already tested my idea; I only needed players in uniform. However, that was the challenging part. The new sports editor decided to tell me the sports preview would be coming out Sunday, on Wednesday night. Not only did he give me little to no time, he also didn't supply me with any player’s phone numbers or availabilities. Although I normally setup all my portraits in advance anyways, trying to schedule student athletes is always very difficult due to their class and practices times. The above image was shot on a Thursday night at 9:00 p.m. Thankfully, I had no problems getting the players uniforms other equipment. Overall, the spring preview came together nicely. It could have been better though.